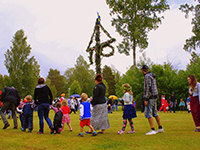 We attach great value to keeping the Swedish traditions alive which originated in recent years at our camping site. This means that we will continue most of the existing events and festivities. On our calendar of events you can find various activities at our camping site as well as in the immediate surrounding area. Each year a local fishing club organises the two day fishing competition ‘Gösdraget’. The gathering place of the fishermen is at the camping site and the boat launch. 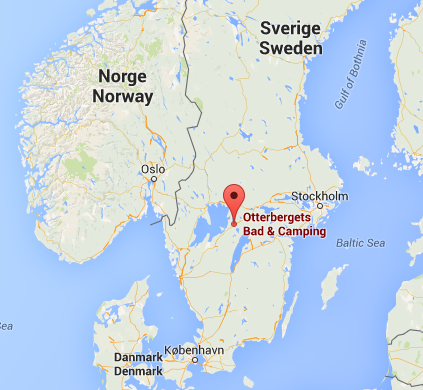 Because of the annual Record Fair in Hova many record collectors from various countries stay overnight at Otterbergets Bad & Camping. To get into the mood for the Record Fair the first trading already starts on our camping site, where the collectors sell and swap their first records. The Midsummer Feast – Midsommar – marks the beginning of the summer. This folkloristic event is celebrated on a large scale at the camping site with a Maypole and all kinds of festivities. 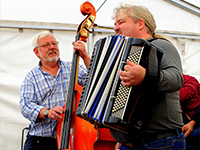 Originating in the kitchen of the camping site house more than ten years ago, this festival has now expanded to a great and much appreciated three day accordion festival. Together the accordion players and other musicians play music in several tents. On Saturday afternoon we have a program with all musicians and on Sunday morning all musicians give a collective performance in the largest tent. The festival nearly always combines with the Autumn Fair, in September in Hova. Many musicians give their performance at the Autumn Fair in the morning. They also play for residents of the home for the elderly.